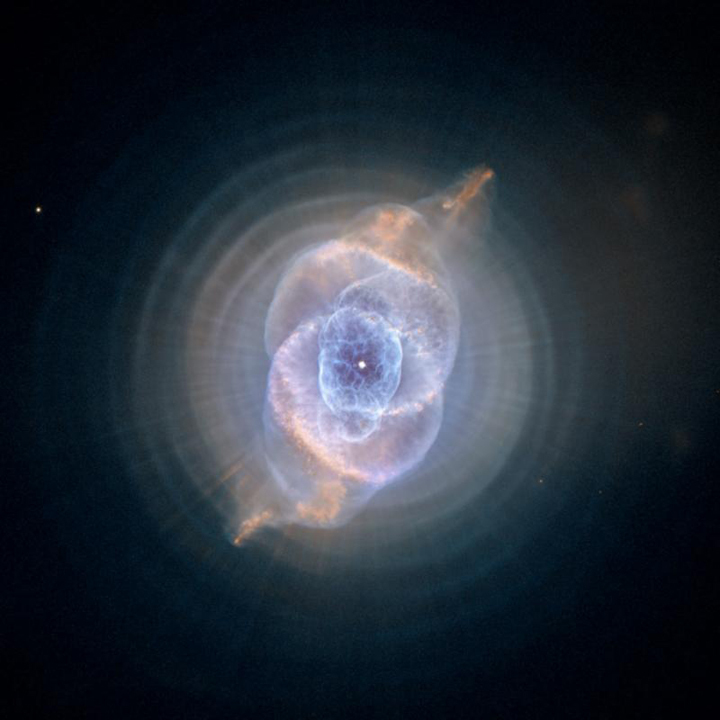 The Cat’s Eye Nebula: Dying Star Creates Fantasy-like Sculpture of Gas and Dust. Credit: NASA, ESA, HEIC, and The Hubble Heritage Team (STScI/AURA). Acknowledgment: R. Corradi (Isaac Newton Group of Telescopes, Spain) and Z. Tsvetanov (NASA). Where do we look in this world for signs of the next? What do they tell us of what is to come, and of our part in our own transformation? These were acute questions in the chaotic interwar period during which the German Jewish critic Walter Benjamin came of age, when modern confidence in human rationality and faith in historical progress had been shattered by mass culture, global economic crises, and world war. In the course of an unfolding political and personal catastrophe—ending with his likely choice of suicide as an alternative to capture by the Gestapo—Benjamin sought redemptive potentials among the ruins of modernity. In formulating what he once called a "weak messianism," he drew on both Marxism and Jewish theology, especially the mystical tradition of the Kabbalah, with which he became familiar through his friend Gershom Scholem. His peculiar blend of materialist and theological criticism, along with his famously hermetic style, have puzzled many readers and licensed diverse interpretations. Benjamin's appeal to messianism has been identified alternately with the triumph of the proletariat and the restoration of divine language. It has also illustrated certain affinities, however, between secular and theological visions, including especially their potential for mutual entanglement. To get a sense of how Jewish mysticism might lend itself to appropriations of the sort Benjamin performed, one can look to the creation story central to Lurianic Kabbalah. As summarized by Scholem, and drastically simplified here, the story comprises four moments, namely: contraction (tsimtsum), emanation (atsilut), shattering of the vessels (shevirat ha-kelim), and repair (tikkun). In the first stage, Luria's major innovation, God contracts into a part of himself to make space for the creation of something other. Following the contraction come the first emanations of divine light, the lights or sparks known as the sefirot that in turn compose the material universe. These emanations combine organizing principles with residual spiritual elements in the space from which God withdrew. Some also take the form of language and letters, which would seem to promise a metaphysical correspondence of word and being. But here the story takes another striking turn. Rather than flowing into discrete forms, the creative emanations from the original figure explode some of the vessels meant to receive them, resulting in a dispersion of fragments from the vessels and sparks of the light within. The universe we inhabit is therefore composed of both shattered forms and residues of creative forces. Throughout subsequent history, the cosmos is engaged in a period of repair or tikkun, where new parzufim, faces or configurations (sometimes translated as "constellations") of sefirot are formed. It is not hard to see how these images might appeal to someone contemplating a rapid social and cultural disintegration. Benjamin's writings are replete with figures of fragmentation and rearrangement, whether he is discussing baroque theater in the aftermath of the Thirty Years' War, the commodity culture of advanced capitalism, or new cinematic forms of representation. Furthermore, the promise of an imminent redemption of a shattered world resonated with the Marxist expectation that capitalist crisis would bring about the material and intellectual basis for communism. Thus, one can argue that Benjamin adopted an allegorical approach to the Kabbalah, secularizing its vision of destruction and redemption. While this means of reconciling theological and secular visions might seem superficial, it takes on depth as soon as we ask just how faithful or unfaithful it is to the Kabbalah, a tradition that both lends itself to secular politics and licenses creative interpretations. First of all, unlike neo-Platonism and its theistic inheritors, the Kabbalah does not necessarily oppose the intellectual and the material since the emanations share in God's substance and power. Thus, while it posits a divine source for the material universe, Kabbalah shares Marxism's reconciliation of matter and spirit. Second, and by the same token, it situates redemption in this world, and ascribes to human beings a special responsibility for its achievement. Third, the Kabbalah approaches divine texts not as an intact code but rather as a set of encrypted puzzle pieces. Like other mystical traditions, it therefore lends itself to both critical and supplementary approaches to orthodoxy, whether an elaboration of halakhic laws or even a conversion to Islam (in the famous case of Shabbetai Zevi). Indeed, whether Divinity can be distinguished from the cosmos itself is a subject of disagreement within Kabbalist interpretive traditions, some of which align it with the pantheism of Spinoza. Today, some even interpret the Lurianic creation story as a Jewish prefigure for the "big bang." Given this history, Benjamin's appropriation of the Kabbalah can be seen simultaneously as unfaithful to its traditional meaning and faithful to its vision, understood less as a given set of beliefs than as a model of exposition. That is, one can see the Kabbalah as an inspiration for Benjamin's approach to both Jewish theology and Marxism, and a model for critical scholarship more generally. Benjamin provides support for this approach in his scattered discussions of his philosophical method, which he links quite explicitly to the Kabbalah in the preface to his study of the baroque. As Susan Buck-Morss has argued in her monumental study, The Dialectics of Seeing, Kabbalist interpretive strategies make an apt precedent for the collage method Benjamin adopted in his later study of the Parisian Arcades, which juxtaposes passages from a wide range of sources without incorporating them in a continuous argument or narrative, though as she points out it was also clearly inspired by the similar techniques of the surrealists. Of course, none of this tells us how to arrange the fragments of tradition in the present or what new picture will emerge. Yet here again we find affinities with Marxism. Prophecy posed problems for Marx, after all, since he presumed human consciousness to be shaped by the same historical forces it contemplates. Hence, Marx sought clues to the future through an exhaustive reconstruction of the past, saying little about communism. Similarly, Kabbalah contemplates a set of traditions whose repair composes an order as yet unrealized. Thus, both Kabbalah and Marxism heighten messianic anticipation without positing a legible roadmap to salvation. It is therefore commonplace to emphasize the "negative" messianic themes in Benjamin's work, an emphasis encouraged by the sad arc of his biography. Anticipation, however, also has the positive effect of driving a search for emergent patterns. It lends urgency to critical powers of analysis and productive associations. Benjamin not only contemplated the dissolution of cultural traditions but also undertook to reassemble their fragments in new configurations. He also suggested that modern subjects might learn to take part in collective acts of assembly, generating new habits and meanings. He explicitly set this task against the cultural restoration promised by the Nazis. Marx famously wrote that the point is not merely to interpret the world but to change it. However, only crude readings of Marx treat language as the mere expression of basic structures rather than a material phenomenon dialectically linked with the whole of human practice and the forces in which it is embedded. As the creation story of the Kabbalah suggests, language is not merely a means of representation but a source of revelation, that is, a repository of creative forces capable of bringing about a new order. For both Kabbalah and the version of Marxism to which Benjamin subscribed, messianic speculations are not merely representations but also acts that transform the present. Theirs is a "weak" messianic power, however, one we can only come to know through its earthly effects. The stakes of Benjamin's combination or even confusion of secular and theological traditions can be seen in this same light. Kam Shapiro is associate professor of politics and government at Illinois State University. He is the author of Sovereign Nations, Carnal States (Cornell University Press, 2003) and Carl Schmitt and the Intensification of Politics (Rowman and Littlefield, 2008).